During the Second World War the tram-line from Manly was closed, which was at first far more significant to the locals than the war. This changed by 1942 when the township of Collaroy was transformed in preparation for war with ‘Brown-out’ regulations such as masking street lights and car lights; black out curtains became crucial for a beachside suburb facing the possibility of invasion. So successful were local efforts to conceal lighting it was responsible for the running aground of the New Zealand vessel Altair. It came ashore near the Long Reef Golf Club. 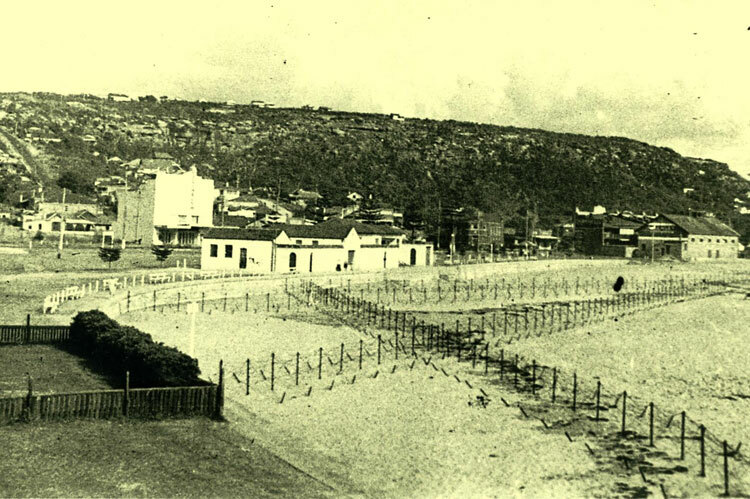 The military feared an invasion and the beaches including the Collaroy rock pool were covered with barbed wire and anti tank traps (the holes where the barbed wire was set to metal stakes are still visible). The concrete steps from the sea wall to the sand were blown up. Around Collaroy barbed wire barricades were prepared to block streets and to deny the Japanese access to the strategically significant plateau and a local Volunteer Defense Corps was formed. On Long Reef headland all the trees below Pittwater Road were cut down to give clear line of fire on invading Japanese. The sand dunes to the south of the Golf Course were leveled and the sand was trucked into Sydney city to fill sandbags for protection of buildings from bombing. Unfortunately the removal of sand dunes destroyed a flourishing Little Penguin nesting colony (see photo above). On 31 May, 1942 it appeared the Japanese would land. The raid by Japanese midget submarines on Sydney Harbour that evening had many locals believing an invasion was imminent. Allied naval vessels in the Harbour played their part and the sound of shells and machine gun fire could be heard by local residents. Black out conditions were strictly observed as locals had reported a positive identification of the Japanese float plane which flew reconnaissance missions over Sydney. At the heart of the raid shell bursts were reported to the north of Long Reef but, the expected invasion did not materialise. In the ensuing days a Japanese landing raft was found one morning on a local beach. A Japanese midget submarine escaped Sydney Harbour that night, crippled, it only made it just north past Long Reef before sinking. It still lies on the bottom today were it was found in November 2006. It has been declared a War Memorial as it contained remains of the two Japanese crew. A Community History of Collaroy SLSC 1911-1995.